X-Men comic books are among the best-selling comic books published by Marvel Comics. For Annuals #1 to #17 click here. For Annuals designated by year (1995 to 2001) go to Uncanny X-Men Annuals. We have 39 of the 141 issues. Story panels missing on several pages. There are problably more spinoffs and different series of X-Men comic books than any other superhero team. 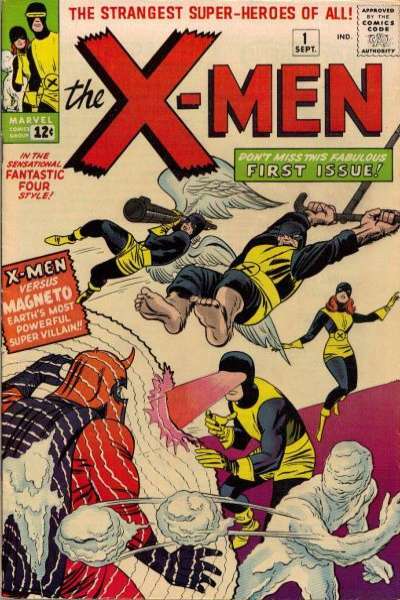 However, the original X-Men series which starting in 1963 is still the most popular. But other X-Men comic books for sale are nearly as popular. Some X-Men series are only one issue long (one-shots) and others are longer, such as Classic X-Men. All of our X-Men comics for sale include a 100% money-back guarantee. So, if you're an X-Men fan or you're searching for X-Men comics for sale, this is the spot! In the entire history of comic books, no single title has launched more spin-off comics than the original X-Men series. The popularity of the characters have spawned titles such as X-Force, X-Factor, New Mutants, Generation X, and on and on. In fact, most every comic book that begins with the letter X is probably an offset of this series. What makes the original X-Men a great series? It's the storyline which strikes a chord with its readers. In this case, it's the alienation of a group of teenagers who are ostracized by their peers due to their differences. There may be no more enduring them that nearly everyone can relate to. In the case of the X-Men, their mutant powers set them apart from ordinary teenagers. And, as most every breakthrough comic of the early 1960's, the writing/artist team of Stan Lee and Jack Kirby (the Babe Ruth and Lou Gehrig of comics) provided the creative spark for the series. The universality of the stories has made the series one of the best reads in comic history and has launched an animated TV series, video games and a very successful film series which includes X-Men (2000), X2 (2003), X-Men: The Last Stand (2006), X-Men Origins: Wolverine (2009) and X-Men: First Class (2011), with four more films in the pipeline. As for the comics, the X-Men's most feared foe was Magneto, who survived the Nazi concentration camps of the 1940s, only to pursue hatred for humanity. (Hey, who can blame him). But that's the point of the Marvel Age of comics. Villains had real motivations. In DC comics of the era, a villain just wanted to "rule the world". Why? Well, why not? But, in the Marvel universe, there was always a real motivation for the villain's evil ways. The series ran for 141 issues and then was renamed Uncanny X-Men. Combined, that's 48 years of continuous publishing, which is an amazing string which again proves the exceptional story telling the series has always provided.